ANONYMOUS -Een schoone Lofkrans deese onse Actie Winkel cierd Met planten, meubelen en veelerly gediert. - Graf kelder der verongelukte actionisten. ANONYMOUS - Een schoone Lofkrans deese onse Actie Winkel cierd Met planten, meubelen en veelerly gediert. - Graf kelder der verongelukte actionisten. Title : Een schoone Lofkrans deese onse Actie Winkel cierd Met planten, meubelen en veelerly gediert. - Graf kelder der verongelukte actionisten.. Size : 16.5 x 8.7 inches. / 42.0 x 22.0 cm. 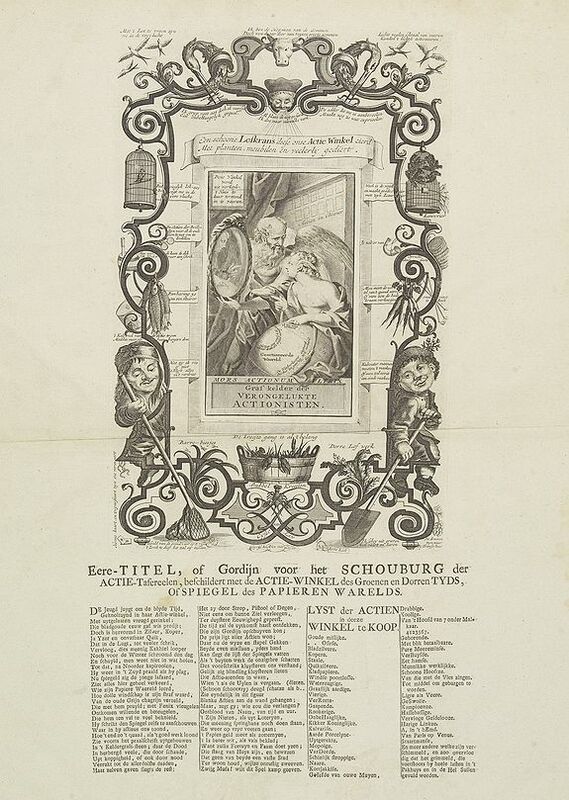 Description :Underneath the engraving text : Eere-Titel, of Gordyn voor het SCHOUBURG der ACTIE-Tafereelen, beschilderd met de ACTIE WlNKEL des Groenen en Dorren TYDS Of SPIEGEL des PAPIEREN WAERELDS. . . Title in English : "Title (page) of Honour, or Curtain before the Theatre of the Action Plays, representing the Action Shop of the Green and Barren Times, or Mirror of the Paper World". Wie zyn papier waereld leerd. Die hem ten val te veel bekneld. Hoe 't end zo 't quaad, als 't goed werk loond. Wien 't als de Uilen is vergaan. (Schoon schootvry) deugd schatze als b?-dieten. Maar zegt gy, wie zou die verlangen? Ontblood van naam, van tyd en uur. Ter woon houd, wyl ze onrustig zweeven. Zwyg Musa! Wilt dit spel kamp geeven. John Law (1671-1729), the son of an Edinburgh banker and successful financier who established the "Banque Générale" in France in 1715, founded the Compagnie de l'Occident for the exploitation of the resources of French Louisiana after Antoine Crozat had surrendered his charter in 1717. Law's reputation caused the stock to sell readily, and the organization soon enlarged the scope of its activities by absorbing other commercial companies, its name than being changed to the 'Company of the Indies'. Enormous profits were anticipated?and the increasing demand for its stock led to wild speculation. Condition : A good and dark impression. Wide margins. Overall good condition. Copper engraving (290x185mm.) with letter press.